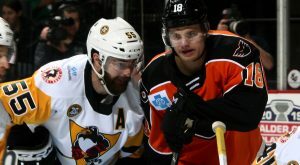 WILKES-BARRE, Pa. – The Wilkes-Barre/Scranton Penguins announced today that defensemen Dane Birks and Blake Siebenaler have been reassigned by the Pittsburgh Penguins (NHL) to Wilkes-Barre/Scranton from the Wheeling Nailers (ECHL). Additionally, Wilkes-Barre/Scranton has recalled forwards Yushiroh Hirano and Cédric Lacroix from Wheeling. Birks just completed his first season of professional hockey, earning one goal and 13 assists for 14 points in 65 games with Wheeling. The Merritt, British Columbia native played in one game for Wilkes-Barre/Scranton at the end of last season, making his pro debut on Apr. 15, 2018 at Hershey. Birks, 23, was drafted by Pittsburgh in the sixth round (164th overall) of the 2013 NHL Entry Draft. Siebenaler was acquired by the Penguins organization from the Columbus Blue Jackets in a trade on Feb. 11 in exchange for a conditional seventh round draft pick. The third-year pro appeared in one game with Wilkes-Barre/Scranton, a 5-4 overtime win on Feb. 17 at Hartford in which he finished the contest with a plus-2 rating. Siebenaler notched two assists in seven games in his time with Wheeling. Lacroix, a first-year pro, led Wheeling with 22 goals this season. Furthermore, his five shorthanded goals topped the team, and his 42 points in 71 games put him tied for fourth on the club. The 24-year old forward also accrued 215 penalty minutes, most on the Nailers and sixth in the ECHL. Hirano became the ninth Japanese player in history to suit up for an ECHL game when he made his Nailers debut on Oct. 20, 2018. The 23-year-old rookie earned 57 points (19G-38A), second-most on the team. He also had 14 multi-point performances in his first pro season in North America. Both Lacroix and Hirano attended Wilkes-Barre/Scranton’s training camp in September and earned one-year American Hockey League contracts with the Penguins in January.